On the day we are to leave Borrego Springs, the news is abuzz with “wind warnings” and weather “alerts.” The Weather app on my iPhone has an ominous Sever Weather Alert. Winds. 60mph gusts. We linger in the warmth of the motel a while longer and debate about going out there or staying in for another night. We decided to push on and are glad we did. While windy, it wasn’t nearly the apocalyptic wind storm that the news made it out to be. And besides, the wind that was blowing was giving us a hell of a tailwind! It turns out to be a glorious riding day and we are moving easily at 15mph. Even the slight hills we encounter, we get pushed up and over. We discover the beauty of the desert. It is a hard place to live, but in these winter months the days are pleasant. We are swallowed by its vastness and its quiet. Compared to the coast, riding in the desert is a relaxing experience. Traffic volumes are low, shoulders are wide and there isn’t the impending logging truck bearing down on the nape of your neck. It is all open space, pink and purple mountains in the distance and bleached clean sand. I never thought I’d like riding this stretch but the last few days have changed my mind. We decided to camp at a primitive site (pit toilet) because it is free and we figure no one would be there. When we arrive there is a multitude of cars but no people. 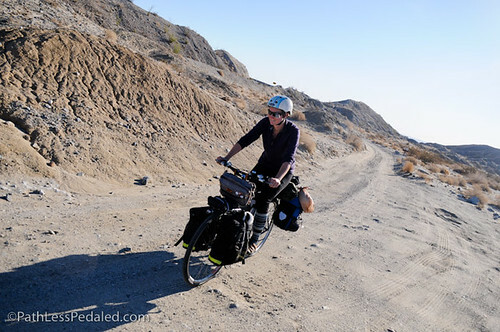 Laura and I spend about an hour riding around on the sandy gravelly road trying to find a place to camp that won’t be so exposed to the winds. After much searching, I see that we have two options 1) camp right next to the pit toilet and use that as a wind shield 2) camp behind this white van we see. I go for option 2 and tentatively ask the people in the camper trailer. They are all smiles and tell us it is no problem. 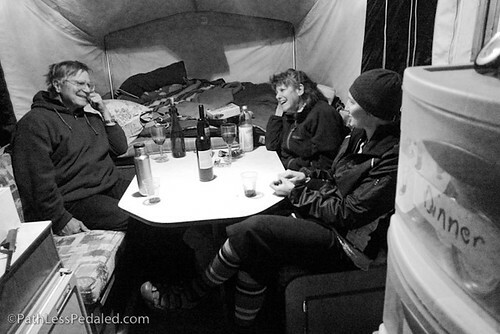 While we are setting up camp, they come out and invite us for some wine. The wind, at this point, is pretty steady and isn’t quitting so the thought of a glass of wine protected from all the flying sand is very inviting. We get camp set up and manage to cook in the wind. 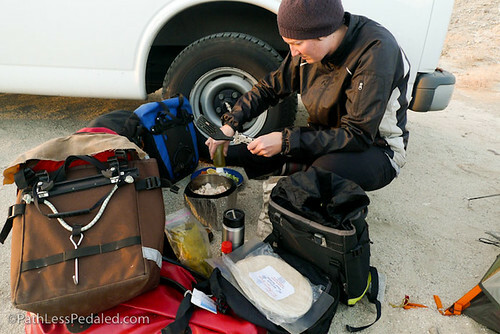 I create an improvised wind block for Laura to cook in – essentially a little fort with all our panniers. After we eat and clean up we join Carl and Sammy for desert cocktail hour. 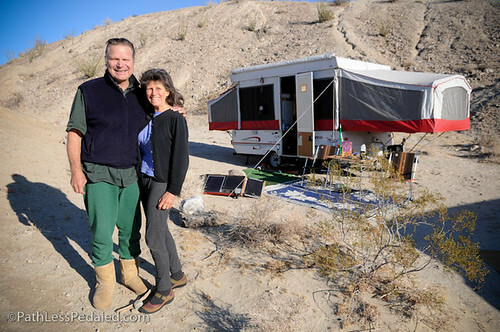 They are from the Bay Area and come to the desert every year. They are also avid travelers and met in Yosemite. The evening is spent swapping tales of travel and adventure and through it all, I think to myself, this is what this is all about. What other space in our lives will we have to do something like this? In normal day to day life, it would seem strange to just talk to random strangers and have that sort of quick intimacy. But now, caught up in the great wave of traveling it is just how it is. This is the culture and social protocol of traveling. Carl and Sammy and great company and it was just what we needed during the holiday season when we are so far from friends and family. 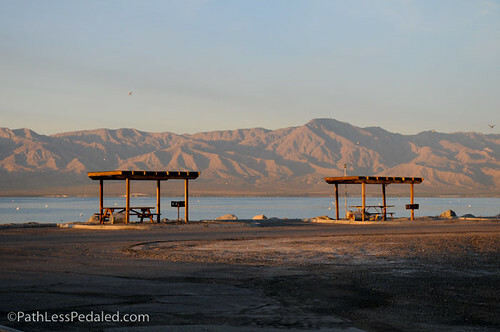 We leave the next morning refreshed and ready for the Salton Sea. The desert landscape reveals strange canyon-like formations – something we would have never expected out here. 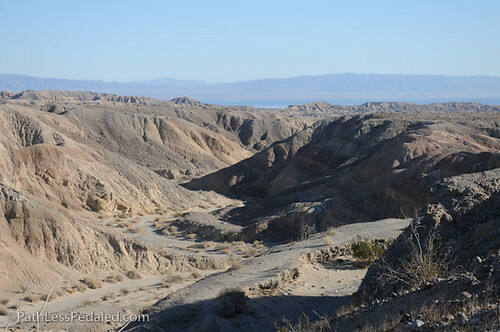 Then we descend and descent into Ocotillio Wells and head towards the Salton Sea. We will look back at this glorious year with fond eyes and remember it as the year that we rode around our vast country like pioneers, like pilgrims, like gods. It is the year that with our tanned faces that we dared to leave our brutish and squared lives and not only dream a better life but live it as we had seen it in our mind’s eye. It was a year of losing ourselves to find ourselves. It was the year that the only plan was not to have a plan. It was a good year. 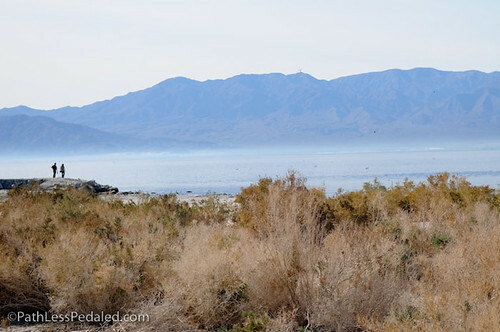 When we reach the Salton Sea we are authentically surprised by its beauty. It isn’t the wasteland we had imagined but something altogether – a strange community that has blossomed despite of itself, as tough and hearty as the plants that survive here. Have a safe and happy Happy! I think this is my favorite post so far! great job! i agree with michael- this is my favorite post too!!! it made me happy reading it. i got a particular joy reading about you guys experiencing the extraordinariness of the desert… happy, merry christmas eve! Merry Christmas! Thanks for your stories and good luck in the new year. Thanks for the great posts that take us all along on the journey. I’ve camped in those areas several times and it is incredibly beautiful this time of year. Great post and pix. Thanks! Looks like you chose the right direction: west to east. 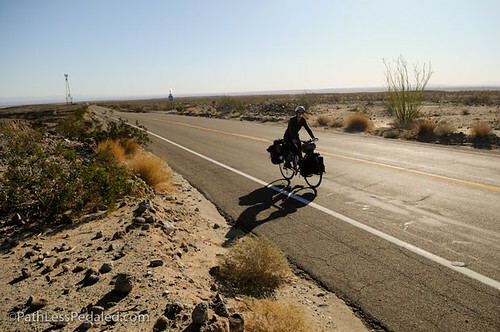 I tried going from Texas to California this time last year and had 60 mph headwinds. And keep enjoying the desert, you’ll see a lot of it! Hope you had a Happy Christmas out there. I’ve seen the Salton Sea from afar from vantage points at Joshua Tree, but never have I actually been there… does it have the smell of the sea? Great Post. We never made it to Joshua Tree. We ended up heading up to Yosemite instead. Cold and snowy up there. Even with the wind, you had better weather.